In early ancient India, Buddhist temples were built with a focus on stupas. The railing and gateways that enclosed each stupa were decorated with scenes from the Buddha Sakyamuni’s life, episodes from jatakas (stories of Sakyamuni’s previous births), statues of deities, lotus pat terns and other designs. At the time, Buddha was not depicted in human form; it was customary to imply Buddha’s existence using symbols such as the Buddhist wheel, a sacred tree, or footprints. At Bharhut in central India, there is a Buddhist ruin that is representative of temples of the early ancient period. The relief carvings on the massive, three-meter high railing are unrefined but graceful, possessing a power that awes onlookers. Sunga dynasty, ca. 2nd century B.C. Belief in Sakyamuni also focused on tracing the course of his life, and from the early ancientperiod onward, tales of the life of Buddha were formed. 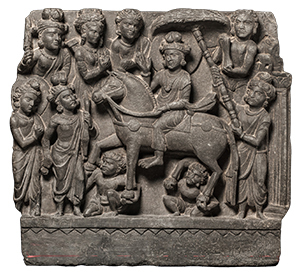 In Gandhara in the Kushan dynasty (1st–3rd century), art depicting these tales developed. Temples were decorated with numerous scenes from Buddha’s life, including episodes from before birth, adolescence, marriage, renouncing the world, undergoing austerities, achieving enlightenment, the First Sermon, entering nirvana (Buddha’s death), cremation, and the building of stupas. Many supernatural events were included in these tales to illustrate Sakyamuni’s greatness. As time passed, the method of expressing the tales shifted from depictions of individual scenes to the form of statues for worship, but adoration for the life of Buddha continued throughout history. It is thought that Buddhist statues were first created in India in Gandhara and Mathura (northern India) at around the time of the Kushan dynasty (1st – 3rd century), which ruled an area of Central Asia from northern India in about the 1st century. Many of the statues of Buddha made shortly after the start of Buddhist sculpture are thought to have depicted the form of Sakyamuni. However, with the rise of Mahayana Buddhism, various other Buddhas were produced. 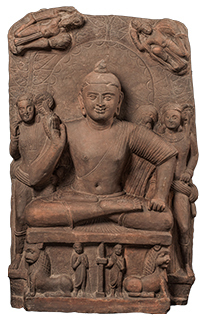 For example, in depictions of Buddha’s teachings distinctive to Gandhara art, the Buddha is interpreted as a universal Buddha or as the Buddha Amitabha based on Mahayana Buddhist thought. In contrast to a Buddha, who has achieved enlightenment, a bodhisattva is someone who is training to become a Buddha in the future. 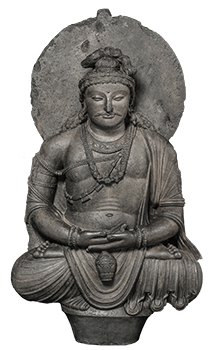 Decorated with ornaments such as crowns and necklaces, bodhisattvas are modeled on the appearance of Indian royalty. With the rise of Mahayana Buddhism, the existence of various bodhisattvas to rescue people began being considered, and these bodhisattvas were differentiated by their hairstyles, crowns and the types of objects they carried. Buddhism also incorporated ancient deities indigenous to India as well as foreign deities, and these performed the roles of guardian deities. In ancient India, the focal point for Buddhists’ belief was stupas, where relics of the Buddha were stored. 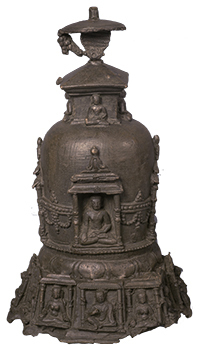 When Buddhist sculpture began, the object of worship shifted from stupas to Buddhist statues, but belief in stupas also continued. Various objects signifying the Buddha’s relics were placed inside stupas. In addition, stupas were built not only for Buddha, but also for monks who had died. Along with the erection of stupas and Buddhist statues as part of the construction of temples, items such as dedication boards were also created. For these boards, clay tablets were decorated with Buddhist carvings for the purposes of personal ownership or donation. Esoteric Buddhism is thought to have started in India in about the 5th to 6th century. Influenced by Hinduism, which had gradually flourished in India, statues with multiple faces and arms were also created in Buddhism; diverse categories of Buddhas, bodhisattvas, guardian deities and devas were established to provide the structure of the world of Buddhas. In the Behala region of Bengal in eastern India, Esoteric Buddhism prospered from about the 7th century onward, while in the Pala dynasty (late 8th–late 12th century), which rose in the 8th century in eastern India, the rulers carefully supported Buddhism, building large temples throughout the land. Buddhist teachings were originally passed down orally, but gradually they began being recorded through written characters. In India at a time when there was no paper, sutras were written down on materials such as tree bark and palm leaves, then bound and stored. Even when paper started being used, this format continued. In this part, three types of sutra are introduced, from sutras that were established in the early stages of Mahayana Buddhism and then used in recitations for a long time after, to sutras belonging to Esoteric Buddhism. The sutras include vividly colored illustrations. The oldest extant example of miniature painting in a Buddhist manuscript dates back to the 10th century, and its exquisite detail eloquently shows how painting techniques in ancient India were of an extremely high standard. In addition to works from India, this section also features Buddhist art from neighboring Myanmar (Burma). Buddhism spread across a wide area, from India to Central Asia, Southeast Asia and East Asia. Even after Buddhism’s popularity declined in India, Buddhist beliefs continued in various forms in surrounding countries. It appears that Buddhism had spread to Myanmar by about the 5th century, and in the Bagan dynasty (1044–1299), Theravada Buddhism entered the mainstream, which contributed majorly to the popularity of Theravada Buddhism in Southeast Asia. 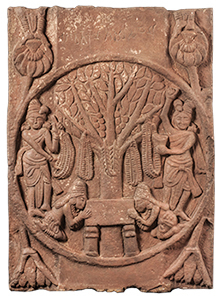 This exhibition includes a work depicting the Vessantara jataka, the most famous jataka (story of Sakyamuni’s previous births) in Theravada Buddhism. 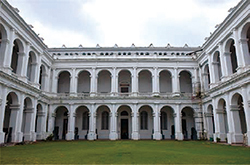 The Indian Museum in Kolkata (formerly Calcutta) was founded in 1814 and is the country’s first general museum and one of the largest in all of Asia. 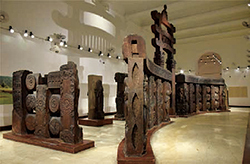 Among all its holdings, country’s first general museum and one of the largest in all of Asia. 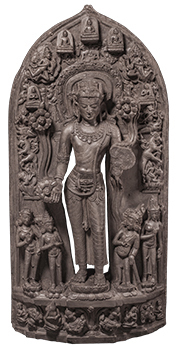 Among all its collection of Indian Buddhist art is particularly excellent, encompassing a host of outstanding examples from Buddhism’s earliest days through more recent centuries. The collection includes a recreation of the Bharhut stupa (c. 2nd century B.C.E.) with the early collection includes a recreation of the Bharhut stupa (c. 2nd century B.C.E.) with the early Indian Buddhist art of that period, carvings of the Buddha from GandharIndian Buddhist art of that period, carvings of the Buddha from GandharIndian Buddhist art of that period, carvings of the Buddha from Gandhara and Mathura during the Kushan Empire (1st -3rd centuries), which saw the birth of such Buddhist images, fine arts from the Gupta Empire(4th - 6th centuries) the so-called Golden Age of Indian culture - as well as masterpieces from the esoteric Buddhism that arose during the Pala dynasty (8th-12th centuries). Closed Mondays (Except for Monday, March 23, 30, May 4), and closed Thursday May 7. * Advance tickets will be on sale at the museum ticket booths (during museum opening hours excluding the last 30 minutes), e-Ticket Pia (P-code: 766-550), Lawson Ticket (L-code: 35680), Seven Ticket (Seven code: 035-057), E-Plus, JTB, FamilyMart and other major ticketing agencies from Saturday, January 17 to Tuesday, March 16, 2015. * Special exhibition "Masterpieces of Buddhist Sculpture from Northern Japan" (Wednesday, January 14 - Sunday, April 5, 2015, Honkan Room T5) , "Masterpieces of Kosan-ji.Temple: the complete scrolls of Choju Giga, Frolicking Animals" (Tuesday, April 28 - Sunday, June 7, 2015, Heiseikan) requires a separate admission fee. With the Sponsorship of Sojitz Corporation. ; Nozaki Insatsu Shigyo Co., Ltd.; Mizuho Bank, Ltd.; MITSUI & CO., LTD.